Diagnosing why a job failed often involves jumping onto servers and parsing through logs to find out what happened. Starting today, we're making it easy to see the job's output to help get problems resolved faster with new error logs. Error logs, a feature of Error Notices, are available right now to anyone using Field Agent and are on the Surveillance Van plan or higher. To get started you need to set up your job to be monitored by Field Agent. Our documentation is a great place to start. As always, if you have questions let us know. For those of you who use integrations for alerts, don't worry. You'll be able to access error logs from Slack and PagerDuty, which will include a link right to the logs when available. To start being alerted immediately when your job runs but errors, and access to the error log output, you may want to consider upgrading to the Surveillance Plan or higher. Level up your Snitches with our two newest features: Smart Alerts and Error Notices. Both features are focused on letting you know as soon as possible that a critical job ran into problems. They also make it easier for you to get those issues fixed a lot sooner. Together, Smart Alerts and Error Notices create a powerful combo. Error Notices let you know as soon as a job runs but errors, and Smart Alerts gives you a safety net when/if that job fails to run at all. Smart Alerts empower your Snitches to let you know sooner when they go missing. Dead Man's Snitch will learn from your snitch's check-in behavior and adjust the expected check-in time as it learns more about when your snitch checks-in. This means no longer having to wait until the end of the day to find out your snitch failed to check-in 23 hours earlier. Smart Alerts are available for weekly and monthly Snitches for all paid plans. Hourly and daily Snitches are supported on the Surveillance Van plan. It's now possible (and highly recommended) to send your job's exit status along with your check-in rather than checking in only on success. If your job runs but errors, we will immediately notify you if something went wrong. If you're already using the Dead Man's Snitch Field Agent, then there are no changes required and you can start getting Error Notices today. If you're using an HTTP client (like Curl) to check-in, you can send the status as the "s" parameter in either the query or a form. We will treat an exit status of "0" as a success and anything else as a failure. When using Cron it's also important to always check-in whenever your job runs and not only on success. To do this replace "&&" with ";" and use "$?" to get the exit status of your command. To get started with Error Notices you can read up on the documentation. This feature is available for users on the Surveillance Van plan. If you haven't already, you may want to add our Field Agent to your tool set. Error Notices is just the first of a host of features we have planned that take advantage of the Field Agent. Start using the Field Agent today so you’ll be ready when we roll those features out. We've made it easier to access your invoices and track your expenses. Now, when you receive your email confirming your payment, your invoice is attached right to the email. As always, you can still find a list of all your invoices on your account page. Like this and want to let us know? Have ideas on how to make it better? Shoot us an email! We’ve improved what you see when you’re looking at your snitches! 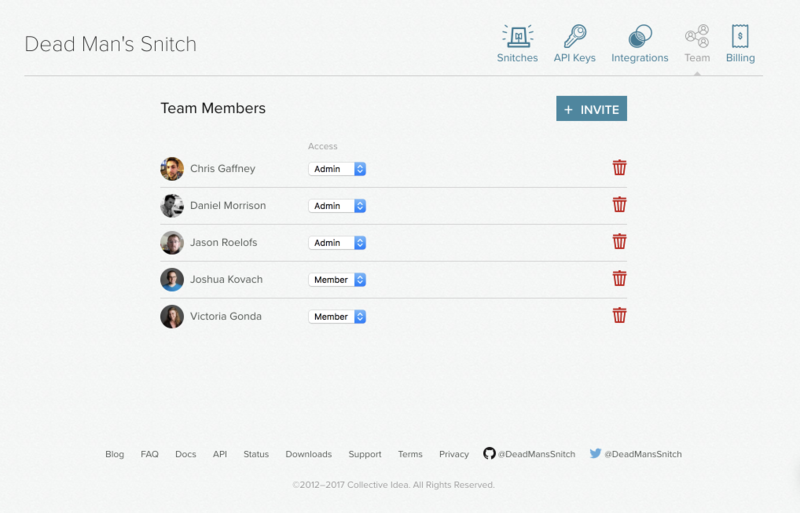 When you check up on your snitch, you’ll see a report describing any recent incidents. With this, you will quickly be able to see if your snitch failed to check in at any point, how long it was missing, and if it still needs attention. We also list your snitch’s check-in activity with all new graphics. It is now easy to see when during a period your snitch checked in. This visual can help you to find abnormalities in your job’s check in time, or just be reassured that everything is running as expected. Note, we changed the icon for when a snitch misses a check-in (in preparation for some future developments). You will now be alerted with a blue question mark icon instead of the red 'X'. Let us know what you would like to see on this page in the future!